Classy is the norm and for those who appreciate small detailed items. This is the item. This uniquely designed espresso cup and saucer are one of a kind. The cup is a double walled stainless steel presenting a polished finish. It is amazingly beautiful and will capture the eye of anyone. The cup was designed to standout, and it can hold up to 160ml of liquid. With an option to laser engrave your precious logo on it, this is the best item to use when promoting your business brand. 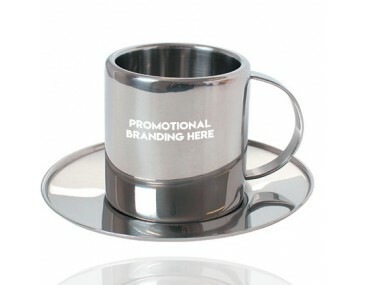 The cup will bring style and elegance to your company as it will capture the heart of the user with its beauty. 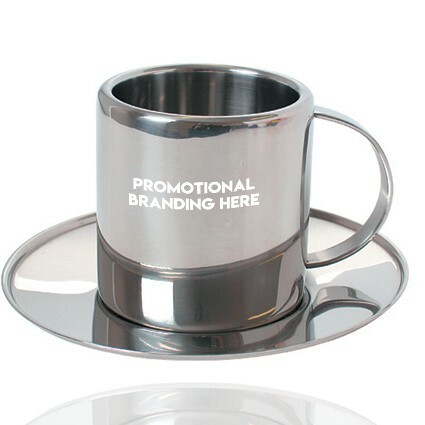 You can give away the cup and its saucer to your loyal clients as a gift. It can also be distributed amid events hosted or sponsored by your company for brand promotional purposes. The cup’s saucer blends well with the cup as it forms a cute reflection. The shiny finish presents classy and makes the cup an item not to miss in the room. Who Uses These Branded Cup Gifts? This product set is perfect for use in restaurants, coffee shops, homes, and boardrooms. There is no doubt that your company name will be presented stylishly as this cup continues to carry its name in the eye of the public. It is easy to clean and lasts for a long time. Delivery period takes 2 weeks upon the approval of your payment and artwork. At the moment, goods are only delivered within Australia. Note that GST is excluded in the prices as well as a custom one position laser engraving print of your logo. A $60 branding set up fee is applied to each unique order placed.